On the way to my studio is the Highline. This abandoned track has recently been converted to a public park championed by the Friends of the Highline organization. In the process of dressing up this dilapidated track, they have begun painting portions of wall along certain sections. Two recent casualties of this action were a PK throwup and a KID throwup. 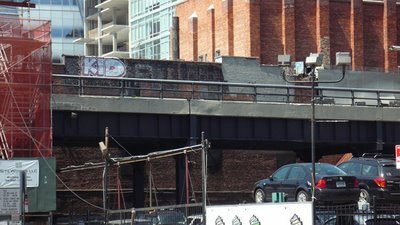 I wrestle with graffiti's place in our public spaces, but I can definitively say these two pieces had grown on me over the years, and I mourn the loss of these woks. I know the Friends of the Highline are trying to clean and beautify this public space but their mistake was thinking these tags detracted from the visual landscape when in fact they added a rich texture and history to the wall that only becomes apparent through the grafitti's patina, the age of the spray paint, and the history of writing culture. What a shame. I think those PK pieces had been there for 20-something years. I remember taking car trips through the city with my family when I was a kid and I always remembered the PK tags. Kind of sad. Long live graffiti death to monoculture!! !